Washington lawmakers should focus on students, behavioral health and the environment. No rest for the weary, they say. And that is true for the 2019 Legislature, even after the marathon of six years of lawmakers struggling to correct the state’s failure to fund basic education — all while under an order by the state Supreme Court. While the high court gave a nod to the Legislature’s plan to answer its 2012 McCleary ruling, much still needs to be done on education. Chiefly, that means finally and fully funding special education but also making tweaks to ensure the new approach works for all of the state’s students. What are your priorities? Send a letter of 200 words or less to letters@seattletimes.com with your full name, address and telephone number for verification only. Include “Legislature” in the subject field. Another major issue that should be weighing heavily on lawmakers is the state’s utter failure to respond to the human suffering pervasive in the state’s behavioral-health system. Lawmakers should focus on making progress on the environment, keeping in mind that the best place for conversations about climate change are in hearing rooms and not at the ballot box. Citizens should be vigilant, too, as the Legislature grapples with the direction it will take in complying with a judge’s ruling that it is, indeed, subject to the state Public Records Act. Last year, citizens were provoked when the Legislature hastily voted to exempt itself only to be stopped by a governor’s veto. 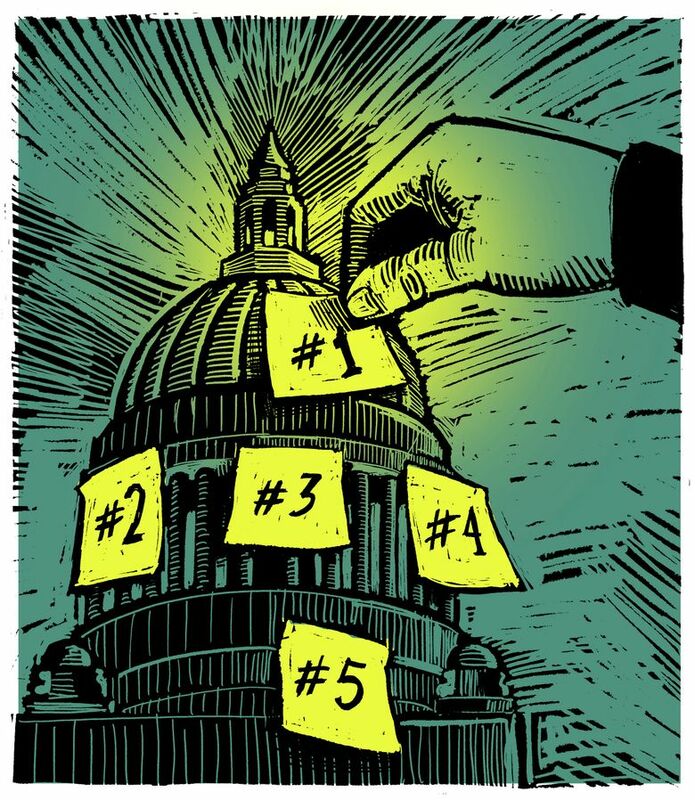 Below are The Seattle Times editorial board’s priorities for the 2019 legislative session. Before anything else this year, the Legislature must fix the egregious state shortfall in special education funding. This matter is urgent. While the Legislature, under court order, has plowed billions into basic K-12 education, lawmakers all but set special education aside, as if these students are not entitled to the amply funded education to which their peers are. The special education funding gap should have been fixed last year when lawmakers finished answering the Supreme Court’s 2012 McCleary decision on school funding. But it wasn’t, which threatens budget deficits in many school districts, which under the new law are not supposed to ask local voters to fund anything that is related to basic education. Only so-called enhancements can be the subject of local levies. Voters with levies on the ballot this February, including in Seattle, need the clarity only the Legislature can provide. Most of the levies set for the February ballot mention special education in the school district’s plan for how the money will be spent. Seattle Public Schools alone says it needs $60 million to fill its special education funding gap. Superintendent of Public Instruction Chris Reykdal, last year, called for the Legislature to add $160 million to the state biennial budget for special education. Yet, lawmakers added just $26.9 million for the 2018-19 school year. Reykdal has proposed a new tiered system to provide a different level of funding for students according to how much of their day is spent in special instruction. This proposal offers a framework for tackling the special education shortfall. Lawmakers should fix the special education problem by adding funding in a supplemental budget, which can be passed early in the session. This fast action would provide crucial clarity for students’ education, district budgets and voters, who should not be asked to fund special education in February. Legislators must reject Gov. Jay Inslee’s absurd and harmful proposal to eliminate a key part of McCleary levy reforms. The heart of the state Supreme Court’s landmark McCleary ruling was that Washington children had unequal opportunity because the state was relying on a mishmash of local levies for K-12 funding, instead of amply and directly funding basic education. To ensure equity, and a quality education regardless of where one lives, the state must fulfill this core obligation, as required by the state Constitution. Reforms enacted over the last two years and accepted by the state Supreme Court increased the state property tax to fully fund schools. They also reduced local school districts’ levy authority, capping local operating levies at a lower level, so taxpayers don’t face a double whammy and the state doesn’t backslide and shirk its K-12 obligation. Local levies can be used only for supplemental programs, such as sports or after-school programs. This is a critical year to make the reforms work and prevent another 40 years of lawsuits and haggling. Yet Inslee and a few lawmakers now want to remove those levy guardrails and return to the old, broken system allowing districts to collect nearly a third of their revenues — 28 percent — through local levies. Easing these levy restrictions would prioritize union organizers, who will get more to bargain with, over children, families and taxpayers, who need equitable and reliable state-centric school funding. It’s galling after bargaining last year won double-digit raises for educators across the state, raises which some districts can’t sustain without busting the McCleary cap and raising levies. Yes, a few districts were left short under the complicated McCleary funding reforms. They can be helped with minor tweaks and the state’s levy equalization program. Yes, the state definition of basic education isn’t perfect and doesn’t fund enough nurses and counselors in some districts. Fix the definition instead of breaking the heart of McCleary and jeopardizing a sweeping K-12 upgrade that took decades to resolve. If the Legislature fails to fulfill promises to amply fund schools, including special education, then the mix of local funding might be something to reconsider. But that’s not the case today. The Legislature stepped up, dramatically increased funding and committed to fill relatively small gaps found as McCleary is implemented. Legislators should keep up the good K-12 work. Don’t let the governor and a few arm-twisters break McCleary and make you start all over. The state cannot continue to funnel some of our society’s most vulnerable individuals into a mental-health system that is broken, overburdened and inadequate. By several measures, Washington’s mental-health system hit historic low points last year. Federal inspectors yanked $53 million per year in funding from Western State Hospital, the 850-bed psychiatric facility in Lakewood, after it failed multiple inspections. Meanwhile, the number of people languishing in jails while awaiting a psychiatric evaluation or treatment reached an all-time high, according to the Department of Social and Health Services. Today, 260 mentally ill people accused of crimes are still awaiting mental-health treatment or evaluation. Another 77 who were committed due to being a danger to themselves or others are still waiting to be discharged from Western State, backing up the system even further. This must be the year the Inslee administration and state lawmakers finally begin to solve this long-festering problem, which has contributed to a pattern of families in anguish and a statewide homelessness crisis. To start, the Legislature must expand alternative treatment programs that allow patients to receive treatment in their communities, in addition to Western State. The state must find ways to intervene in patients’ lives earlier, providing targeted assistance before someone is in crisis and requires costly inpatient treatment. “We want to make sure we are not growing the buckets of people that are at Western or need civil commitment, but really making sure we are providing services to people as early on as possible,” said state Sen. Manka Dhingra, D-Redmond, who chairs the Senate’s Behavioral Health Subcommittee. Some money will be required upfront to pay for these innovative outpatient treatment programs, as well as to add community treatment beds and permanent supportive housing. But whatever the Legislature dedicates to mental health must be carefully targeted, as well as coupled with strong accountability provisions to make sure it is spent as intended. This strict oversight will be key to ensuring that Washington doesn’t continue its disappointing track record of failure. Legislators face a serious test this year about whether they are deserving of the public’s trust. They must not repeat their gravest error of 2018, when they rushed through a bill exempting themselves from the state’s Public Records Act. This bedrock government-transparency law is what ensures that citizens can keep an eye on all levels of government, from small-town city councils to the governor’s office. It is a crucial tool for holding public servants accountable, allowing everyday people as well as journalists to monitor how government officials are conducting the public’s business. Yet state legislators were deeply shaken when a Thurston County judge ruled a year ago that they had been illegally flouting the law for years. The Legislature passed a bill that would have closed off access to all of lawmakers’ past working documents, while requiring the release of only certain records going forward. The people were outraged. Ultimately, Gov. Jay Inslee vetoed the legislation after his office received more than 20,000 requests from citizens asking him to do so. But many lawmakers continue to struggle with the basic notion that they should be required to release the same types of documents as other government officials. These include records such as calendars, emails, text messages and disciplinary reports. Particularly in the age of the #MeToo movement, records of investigations into alleged misconduct by legislators cannot be shielded from the public. Nor can documents illuminating how the Legislature is handling these types of workplace complaints. Lawmakers should embrace a fundamental shift in attitude and find ways to comply with the law. This process may require a few subtle tweaks in language, as well as updating the Legislature’s record-keeping systems. Some of the Public Records Act’s existing 500 or so exemptions might need to be narrowly adjusted to ensure they appropriately extend to state lawmakers. But legislators should abandon the idea of creating a new law that applies exclusively to them. Even as the Legislature appeals the trial-court ruling, they should seek to work within the boundaries of the existing law, rather than rejecting it at the outset as unworkable. At a fundamental level, state lawmakers should be as accountable to the public as local fire commissioners, utility board members and town council members. Washington’s citizens have sent that message loud and clear. Legislators must prioritize improving Washington’s environment. This includes finding new ways to improve water quality, reduce air pollution, maintain healthy forests and address the critical and heartbreaking decline of southern resident orcas in Puget Sound. At the same time, Gov. Jay Inslee and legislators who championed a carbon tax are chastened by the defeat of Initiative 1631. They must find other ways to improve the environment and respond to climate change, without the cost, questionable return and low accountability of that proposal. The initiative was also a reminder that such policies must be crafted in a way that builds support not just in Seattle but across the state. Inslee and others are floating numerous proposals to get the conversation started, including proposals for a low-carbon fuel standard and 100-percent clean energy goal, both modeled on California policies. Legislators will need to provide clarity about the total cost and impacts of any such proposal to persuade voters who twice rejected a carbon tax. They’ll also need to sift through Inslee’s $1.1 billion orca response plan, a catch-all including prior spending plans. Converting diesel ferry motors to electric “hybrids” has been in the works since 2012, for instance, and the upgrade of road culverts in his plan is ongoing work accelerated by a 2001 lawsuit. An intriguing new proposal is coming from state Sen. Reuven Carlyle, chair of the Senate Environment, Energy and Technology Committee. He’ll introduce a cap-and-trade policy designed to coordinate with California’s program for capping industrial and utility emissions and creating a market for allowances that polluters can trade. “We need to open another front of public discourse and a serious policy discussion,” Carlyle said. Indeed. The Legislature, and not an initiative campaign, is the place to have that conversation and build consensus on the best ways to help the environment.